Image caption The family of Przemyslaw Golimowski described as a "happy, smiley and cheerful man"
Three more men have been charged with the murder of a man in a flat in Bedford. 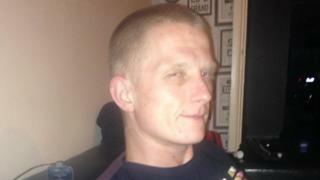 Przemyslaw Golimowski, 30, was found with stab wounds in St Mary's Street, at about 02:00 BST on 28 September. Delpiero Mothersill, 19, and Philip Mendy, 22, both from Bedford, and Damian Rooney, 24, of Wixams, have all been charged with killing him. A fourth man, Jamal Jeng, 21, of Clapham, near Bedford, was charged with murder in October. Police say Mr Golimowski was attacked in his own home. The three newly-charged men are due before magistrates. In a statement at the time of his death, his family said: "Przemyslaw was a much loved son, father, partner and brother. "He has been taken from us in the cruellest way and we are devastated at his loss. "He was a happy, smiley and cheerful man who had the best years of his life ahead of him. He was generous with his time and would have done anything to help anyone."